I really like the smell of this plant. I always disregarded it as a shrub that fills space in the garden. There is one growing right outside my studio room window and yesterday, I was trying to get the screen back into the window and I plucked a couple stems to put into a vase. Later, Matt smelled it and said its scent was nice... and it was! It is fresh smelling, a little medicinal and just a little sweet. Does anyone know what it is called? Update: Thanks to Amelia and Alison! 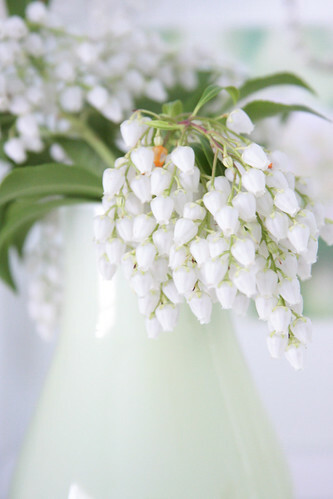 It is Pieris japonica, or also known as the lily-of-the-valley shrub! 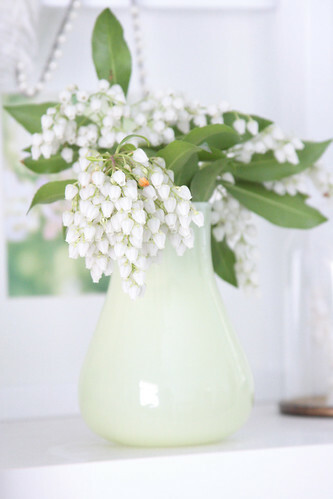 Looks like lily-of-the-valley, but it is a shrub. It has to be easy to grow because it is growing like a weed outside my window and I've neglected to water it... umm, ever. It was here before we moved into the house.